Deeds are used to record a change in property ownership. Quitclaim deeds are typically used for transactions between family members, and gift deeds are used to transfer property as a gift. 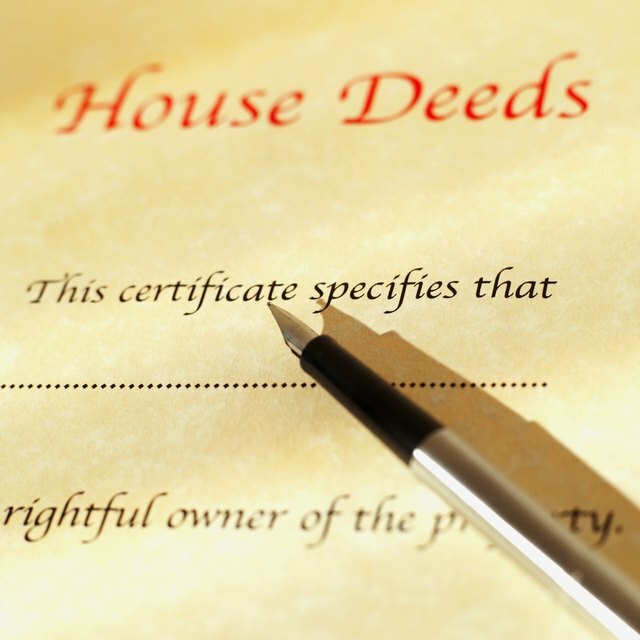 All real estate deeds contain the same basic information: the names of the person handing over title to the property and the person receiving it; the subject property; words of conveyance set down by state law; and valid signatures. Beyond these basic provisions, each type of deed contains clauses appropriate to a specific set of circumstances. A quitclaim deed is typically used to transfer unmortgaged property between family members. The grantor relinquishes his claim to the property and transfers his interests to the grantee. Because the grantor gives no guarantee that his title is good, a quitclaim is commonly used when co-owners of a property, such as a husband and wife, decide that only one of them should own it, perhaps after a divorce. The grantee does not typically require a check on the grantor's title, because he or she is already familiar with it. Quitclaim deeds can be used whether or not money changes hands. A gift deed transfers property as a gift. No money, or anything of value in lieu of money (known legally as "consideration") must change hands. The property is usually stated to be transferred out of "love and affection." The person gifting the property is known as a "donor" and the receiving party is the "recipient." To be valid, a gift deed typically requires the donor to sign the deed in the presence of two witnesses, neither of whom must be the recipient. This may vary across jurisdictions. If you transfer property without consideration, you are effectively making a gift, regardless of whether you use a quitclaim deed or a gift deed. The Internal Revenue Service imposes federal gift tax rules to gift transactions. Under these rules, the grantor pays tax on the fair market value of the property, to the extent that it exceeds his nontaxable annual exclusion. As of April 2019, this is $15,000 for an individual, and $30,000 for married couples. The grantor may be able to claim part of his lifetime exemption in order to reduce his gift tax liability. Gifts between spouses are nontaxable events. If the purpose of the transfer is to allow your spouse to own property, you can use a quitclaim or a gift deed. IRS Publication 950 has further information. Which deed you use for a gift transaction depends upon when you want the gift to take effect. A quitclaim deed takes effect as soon as it is "delivered." Legally, this is when the deed is signed in accordance with state law. Once a quitclaim takes effect, the property is transferred, and the transaction is irrevocable. A gift deed, on the other hand, can be revocable or irrevocable. A revocable deed allows the donor to legally revoke the gift at any point after he makes it. A gift deed donor can also decide when the property transfer takes effect. This can be immediate, or upon a specified future date; in many cases, the donor will specify that the property is transferred to the recipient only when the donor dies. Real Estate Lawyers: What is a Gift Deed?